Last Weekend for Special Pricing for HISTeria at the Tampa Bay History Center! Hey Guys! Jerm here with an update on a special deal that won&apos;t last past this weekend! 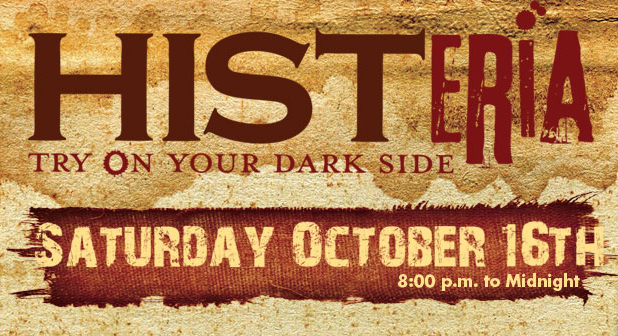 Don&apos;t forget to join the crew over at the Tampa Bay History Center October 16, and explore the dark side of history at "HISTeria" the museum&apos;s first Halloween fundraiser! This night of costumed themed fun will feature food from some of Tampa&apos;s best local restaurants including the Columbia Cafe, Sideberns, Datz and Fly Bar just to name a few. There will be performance artists and a live DJ. Proceeds will benefit the History Center&apos;s educational programs. Tickets include one complimentary beverage and parking. For a limited time only, and by limited I mean the next 48 hours, get your tickets for this awesome party for only $35. After Sunday, ticket prices will go back up to starting at $50. See the HISTeria website for full details on pricing and purchase your tickets. So go and get your tickets as they are sure to go fast, and stay tuned into this blog for updates as we draw closer to the event on this and other Tampa Bay area events and things to do in Tampa Bay!